Roy (Michael Shannon) flees by night with his son (Jaeden Lieberher) and friend (Joel Edgerton), evading sunlight, an Amber Alert, a religious cult, and the FBI in writer/director Jeff Nichols' heartfelt supernatural chase film. This is one of those movies with a real good slow burn mystery, a smoldering secret at its center that the audience is slowly brought along towards. Michael Shannon's performance is a quiet but powerful rendition of a father's love. Damn it, I want to see this very very much but have no idea when it'll open in my part of the planet. Jeff Nichols and Michael Shannon have not yet disappointed. Ok, I'll be back when I actually have something to say about the movie. I was very lucky and saw this at the Samuel Goldwyn Theater (No food or drink! No children! No phones! Everyone watches the movie!) which has rumble boxes under the seats and 80 speakers mounted around the room. I admit I'm getting acclimated to the luxury and it takes a pretty big draw for me to see a film elsewhere. Anyway, for as terse as the dialog is the sound plays a big role and I appreciated the nice setup. Lots of dramatic low rumblings. After the screening Jeff Nichols took questions from a local NPR host, and he talked about several interesting things. First, he writes on two 'tracks,' one for plot/genre and the other for behavior/characterization. He says it allows him to take the genre elements and dip them in his organic Southern style, merging plot and atmosphere/feeling into a film that feels familiar but still manages to surprise and delight. And the second big thing I took away was that Nichols incorporated a very personal experience into this film: While he was writing it his infant son became suddenly ill and nearly died. That experience really affected him and his relationship to his son, and became a big motivator for the Roy character. He elaborated that the film could really be considered a parallel to the story of a son growing up and away from his parents, moving out into the world and discovering his true place in it. 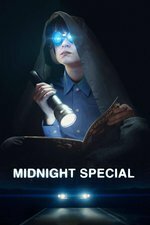 When you condense that (traditionally) 18-year journey into a few days it becomes dramatically tragic, thus Midnight Special. So I liked it. The music was great; the cinematography as well. Both seamlessly disappeared into the drama of the film, which I admire. The way the plot unfolded kept me relatively rapt, though the people I saw it with thought it was slow at points. Some things that fell by the wayside I would have liked to see tidied up (like The Ranch and the folks who live there for instance) and I couldn't tell what the meaning of the stuff at the very end of the epilogue was, if it was supposed to be a sequel set-up or if not then wtf? Now I want to go watch Mud and Take Shelter. Loved Take Shelter and Mud was really really good, so looking forward to see this. I'm surprised with all the "indy" directors being snapped up to helm blockbusters (Rian Johnson, Colin Treverrow) lately that he has been overlooked..
Ugh, I've been waiting for this film for years now and they release it in like two theaters on the coasts and no sign of a wider release. Nichols might be my favorite filmmaker right now but Warner Bros doesn't want my money apparently. I couldn't tell what the meaning of the stuff at the very end of the epilogue was, if it was supposed to be a sequel set-up or if not then wtf? Open ended conclusions seem to be a Nichols signature, Take Shelter and Mud both have them. TV commercials round these parts say April 1. As does the official website. TV commercials round these parts say April 1. As does the official website." Huh, I swear that the website didn't say that a few days ago. Maybe they just locked it in after the opening weekend numbers came in. I think they're a little worried about this one. I saw a free preview screening last night in a theater that wasn't close to full -- highly unusual for a free preview screening at that location -- so awareness isn't exactly high among the general populace. Are you talking about the long close-ups of the three main (adult) characters? I think it's like you call it, an epilogue. It gives you time to look at each one of them, consider what they've sacrificed, and imagine what's going through their minds and maybe what's in their future. But I think it's fairly clear that their stories are over — we've just seen them live through the most important events of their lifetimes. Also, I know Kirsten Dunst doesn't have much screen time and she's not asked to do much (and especially not anything particularly Dunsty) but she is so good in this. Are you talking about the long close-ups of the three main (adult) characters? Yeah! But on the very last one something happens (mouseover for spoiler). Depending on the meaning of that, one of the main characters' future could be very different than the others I think. Bah. April 1 and still only playing in limited cities. I guess I'll have to wait for video. Saw it last night with my wife, and we made up ⅓ of the people in our screening. I don't think it sets itself up for a sequel. The final shot was more of a reveal of something that had been hinted at throughout the movie. If Alton is special, how did he get that way? My wife and I just watched it through Amazon video. It was amazing right up until that epilogue. Ugh, just a beautiful, tense, and captivating film ruined by leaving SO MUCH unexplained. "Ugh, just a beautiful, tense, and captivating film ruined by leaving SO MUCH unexplained." I'll have to politely disagree. I'm always happy when I (as audience) am left in the same boat as characters in the film: not knowing. That's why No Country for Old Men is one of my favorites. Understanding the where/why of Alton would only have diminished things for me. Unrelated: can I just say that the satellite falling on the gas station was one of the more intense action scenes in recent memory? As opposed to all the huge BANG! and GLAM! of modern blockbuster Marvel properties or Michael Bay films, it felt serious and threatening and above all plausible. I was fascinated by the way the filmmakers put it onto the screen. I am asking in a friendly and conversational and non-antagonistic way: what would you like to have seen there at the end? I'm curious. Finally got to see and maybe didn't love it as much as I'd hoped but did admire it quite a lot. I saw Close Encounters the night before in preparation and I liked how it did riff on that older film a bit but not slavishly. It's interesting how this film came out the same year as Stranger Things and share so much borrowed DNA with it but carries its influences much less clumsily than the Netflix series.